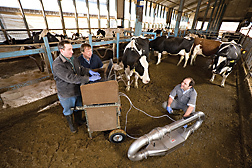 Left to right, Pennsylvania State University agricultural engineer Michael Hile, ARS agricultural engineer Al Rotz, and ARS research associate Felipe Montes use a dynamic flux chamber to measure the emission rates of gaseous compounds from manure on a dairy barn floor. Every year, a hefty dairy cow tucked away in a snug barn produces more than 20,000 pounds of milk, along with an impressive amount of manure and an array of gases. New modeling work by an Agricultural Research Service team in University Park, Pennsylvania, suggests that a dairy cow living year-round in the great outdoors may leave a markedly smaller ecological hoofprint than her more sheltered sisters. Several other ARS University Park scientists collaborated on the project, including animal scientist Kathy Soder; plant physiologist Howard Skinner; soil scientists Curtis Dell, Peter Kleinman, and John Schmidt; and research leader Ray Bryant. For its study, the team used the Integrated Farm System Model, a computer program developed at University Park that simulates the major biological and physical processes and interactions on a crop, beef, or dairy farm. The scientists collected a range of field data on grazing systems and manure management and their effects on nutrient loss to the environment. Then they input this field data into their farm model to evaluate the environmental dynamics of four different dairy farms in all types of weather over 25 years. 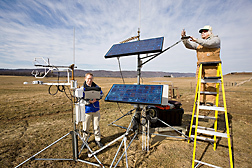 Plant physiologist Howard Skinner (left) and technician Steve LaMar check sensors and download carbon dioxide flux data from an eddy covariance system on a pasture at Penn State, Haller research farm. The data is used to monitor carbon sequestration on pastures and contribute to whole farm carbon footprint modeling. One simulation modeled production on a confinement farm that contained a herd of 85 large-framed Holsteins, each producing 22,000 pounds of milk every year, and 76 replacement heifers. Another modeled production on a confinement farm with a herd of 100 moderate-framed Holsteins and 80 replacement heifers. Each cow in this system produced 18,500 pounds of milk each year. A third type of farm in the model also had 100 Holsteins with average frame size and 80 replacement heifers. But in this system, the cows were able to graze for up to 7 months every year. Each cow in this system also produced 18,500 pounds of milk every year. The last farm in the model had a herd of 130 small-framed Holstein/Jersey crossbred cows and 95 replacement heifers. This herd was maintained outdoors all year, calved in the spring when forage availability was at its peak, and was managed with rotational grazing during the summer. Cows in this system produced almost 9,000 fewer pounds of milk per cow each year than cows in the confinement system with the highest production. All four systems were set to produce essentially the same amount of milk—adjusted for fat and protein—on the same land. Standardizing the total milk production across the four production systems allowed better comparison of the various environmental impacts across systems. The model generated estimates for ammonia emissions from manure, soil denitrification rates, nitrate-leaching losses, soil erosion, and phosphorus losses from field runoff. Estimates for emissions of carbon dioxide, methane, and nitrous oxide from both primary production and secondary production of pesticides, fuels, electricity, and other resources were also considered. Keeping cows outdoors also helped reduce fuel use and the resulting carbon dioxide emissions from farm equipment, because producers didn’t need to plant and harvest as much feed for their livestock. Average net farm greenhouse gas emissions dropped about 10 percent by keeping the herd outdoors year-round. When fields formerly used for feed crops were converted to perennial grasslands for grazing, carbon sequestration levels climbed from zero to as high as 3,400 pounds per acre every year. The scientists also calculated the carbon footprint left behind by cows in each of the four management systems for every pound of milk produced. They found that a well-managed dairy herd kept outdoors year-round left a carbon footprint 6 percent smaller than that of a high-production dairy herd kept in barns. What’s good for the air is also good for water. When high-producing dairy cows were kept in barns year round, the associated sediment erosion from growing corn and alfalfa for feed averaged 2,500 pounds per acre. But when cows foraged on perennial grasslands—their diets supplemented as needed with purchased feed—sediment erosion dropped 87 percent to an average of 330 pounds per acre. Runoff of phosphorus, a major pollutant in the Chesapeake Bay Watershed, dropped from around 57 pounds per acre to 44 pounds per acre. “The model results are supported by years of field work, so they’re in line with what we expected,” Rotz says. “Now we’ll use this model to evaluate other mitigation strategies for both grazing and confinement livestock-farming systems.”—By Ann Perry, Agricultural Research Service Information Staff. To reach scientists mentioned in this article, contact Ann Perry, USDA-ARS Information Staff, 5601 Sunnyside Ave., Beltsville, MD 20705-5129; (301) 504-1628. "Putting Dairy Cows Out to Pasture: An Environmental Plus" was published in the May/June 2011 issue of Agricultural Research magazine.